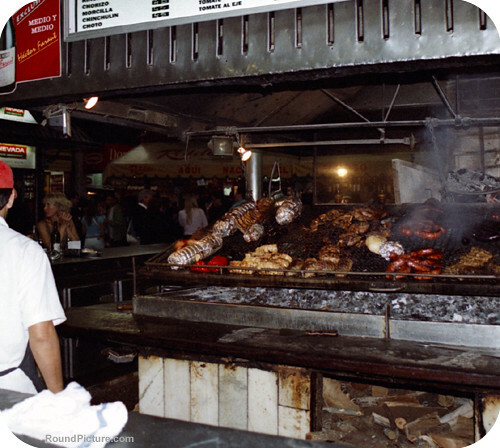 Mercado del Puerto (Port Market) is lively, casual, and it is a great place to taste the famous Uruguayan Parilla. As you enter the big warehouse type building full of restaurants and Parillas (Uruguayan style BBQs) you will be welcomed by the rich bouquet of the open BBQs, and your mouth will water at the sight of succulent meat, sausages and vegetables laid out on grills around you. If you are already used to the exceptional quality and value of beef from Uruguay and Argentina, you will want to choose an above average cut of meat as the prices here cater to the middle class. Medio y medio (part sparkling wine and part white wine) is the drink of choice for the locals here to accompany their juicy steak. If you like to see Mercado del Puerto when it is full of buzz, Saturday afternoon is a good time to go. Things calm down on Sundays. Every city needs a place like this where people can eat well and be happy. Buon provecho!